Update for 6.0: This strategy still works. However, due to a few other changes, in the interest of a strategy that’s not prohibitively rare, I definitely recommend the crab over the crawdad. If you’re here with your Elekk Plushie on your Awfully Big Adventure, this strategy will work swimmingly. 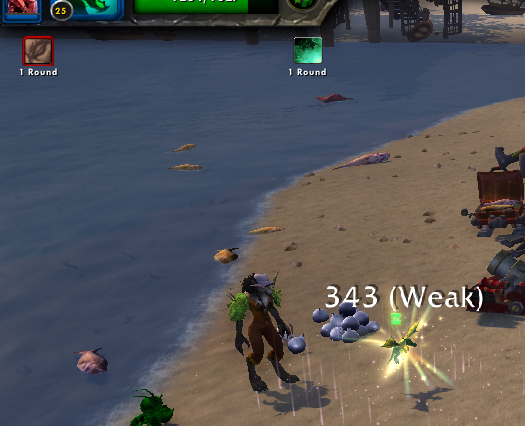 This guy was one of my toughest opponents as I was working my way through the tamers in Pandaria. However, he’s one of the more conveniently located tamers, right next to the Anglers Village in Krasarang if you’re into that kind of thing, so I try to stomp on him on a regular basis. This fight is very gimmicky and your success or failure depends really heavily on how often you get stunned, or slept, or whatever else. Both Mo’ruk’s final 2 pets use these abilities. This strategy gives you a very high chance of success, but I’d say once a week or so I have to heal everybody and try again. 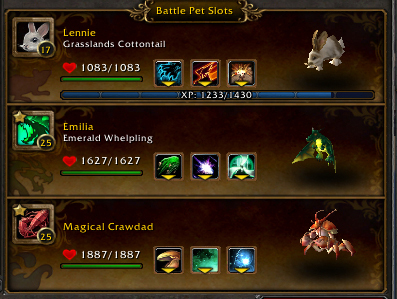 The crawdad is particularly healing-motivated, and the emerald whelpling is particularly geared toward magic DPS and a bit of healing. This fight is quite RNG dependent, but these 2 pets mitigate the R in RNG quite a lot. I’d suggest trying a Spawn of Onyxia or another high dps dragon in Emilia’s slot. I’ve used an Infinite Whelpling with decent success too. I frequently have decent luck with my Emperor Crab tank in the Crawdad slot. 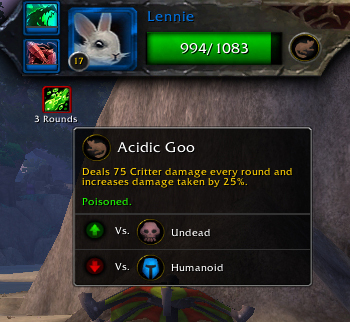 Your leveling pet has to be able to take roughly 400 damage at minimum. The leveling pet goes in first, as a soak. Moruk’s Woodcarver is a Beast and the first ability, Acidic Goo, is a DoT which increases your damage taken. Since Woodcarver’s 2nd ability is always the hard-hitting Burrow, it’s a good idea for your first pet to grab that buff before you swap in your Crawdad. This is a fairly straightforward fight. He’ll use Burrow, and Acidic Goo when he can. He also uses the Consume ability to occasionally heal himself. If at all possible, try to make it so that you’re at high health and have your Renewing Mists rolling when you kill Woodcarver. When he dies, you have to IMMEDIATELY swap to your dragon. Don’t even try to get cute and cast Wish. This is where the RNG battle begins. 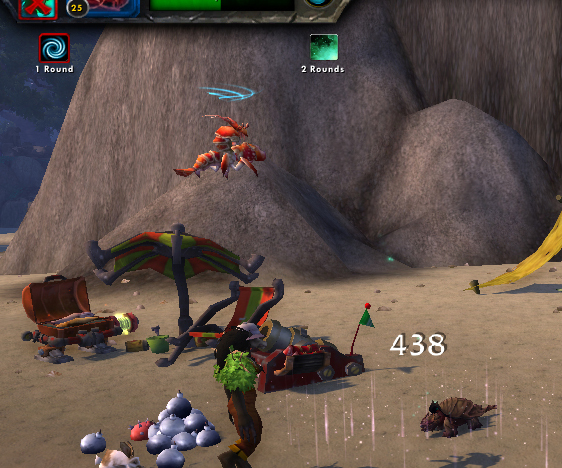 Lightstalker‘s first hit is fairly hard, even with the Dragon’s strong defense against Flying abilities. It also has a 25% chance to sleep you. This is why we swapped out the Crawdad ASAP… he’s aquatic, so he takes so much damage just from that first hit, plus the fact that you’re going to be slower, so you may just get stunned for the effort. Lightstalker also has the Moth Balls ability, which will slow you, and he combines that with Alpha Strike, which does more damage if he’s faster than you. He’s a bit of a glass cannon, is what I’m saying. The goal here is to burn the moth down as quickly as you possibly, possibly can. This is why I went with the Emerald Whelpling with that specific moveset. Magic damage ahoy. If the moth manages to kill your Dragonkin with RNG, you’re quite likely screwed. The last pet, Needleback, has a few interesting moves. He has the speed increasing small nuke Powerball, which means after a turn or two you aren’t going first anymore. He also has Grasp, which does minimal damage but prevents swaps. And then there’s Headbutt, which does a lot of damage and has a chance to stun you. Yeeeah. This is why my #1 choice to finish it out is the crawdad. Needleback inevitably uses the Headbutt ability when it’s off cooldown, so the turn before it comes up I can use Wish if I need to, to make sure I don’t die if I get stunned. The crab is a solid choice too, but he doesn’t have that extra failsafe the (expensive, hard to get) Crawdad does. Most of the time with this team and strategy, I win. Every so often the RNG stars align to hand me a loss. If this is your first time going after this tamer, try sticking the crawdad or a crab in the first slot to soak that first Acidic Goo, then swap in a mechanical to kill the beast. I’d feel worse about calling Mo’ruk a fight-cheesing jerk, but it’s hard to feel bad for someone who lives on a freaking beach, okay? This entry was posted in tamers and tagged Grand Master Tamer, powerlevel, strategy on June 18, 2013 by Liopleurodon. Good luck, literally. Thanks for reading! Yeah, you’ll get decent results with aquatic tank/some dragon in general. I’ve also heard of people using a Mecha Dragonling or Zep to blow the first guy out of the water ASAP, then do a little extra damage and Explode. The RNG is what makes this fight difficult, so I tried to come up with the combo where I can compensate for the randomness as best I can. 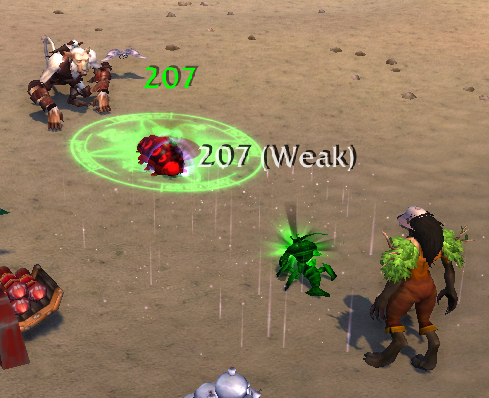 if you use a pet with arcane storm first it will prevent you from getting stunned for 9 turns. I found that to help alot. Ooh, that’s a good call! I tend to forget about that weather effect, but now that you say that I can think of a few other strats that may need a revisit, too. Thanks for pointing it out!